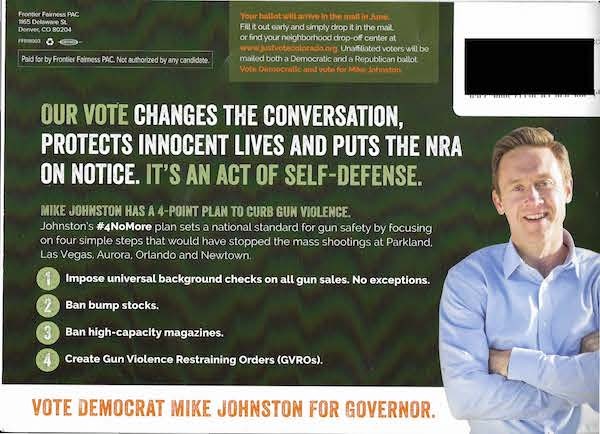 About the message: This the third mailer we've seen sent by super PAC Frontier Fairness supporting Democratic gubernatorial candidate Michael Johnston and focusing on solving gun violence. It cites a four-point plan the former state senator advocates, which includes banning bump stocks, universal background checks (which are pretty much the law already in Colorado), banning high capacity magazines (anything over 15 shots is banned in Colorado) and creating gun violence restraining orders, which the state Senate rejected earlier in May. The mailer also encourages voters to return their ballots early. About the messenger: Frontier Fairness is an independent spending committee supporting former Democratic state Sen. Michael Johnston in the governor's race.